Standalone, compact device for card payments on the go. Simple to get started, no lock-in and no monthly fees. 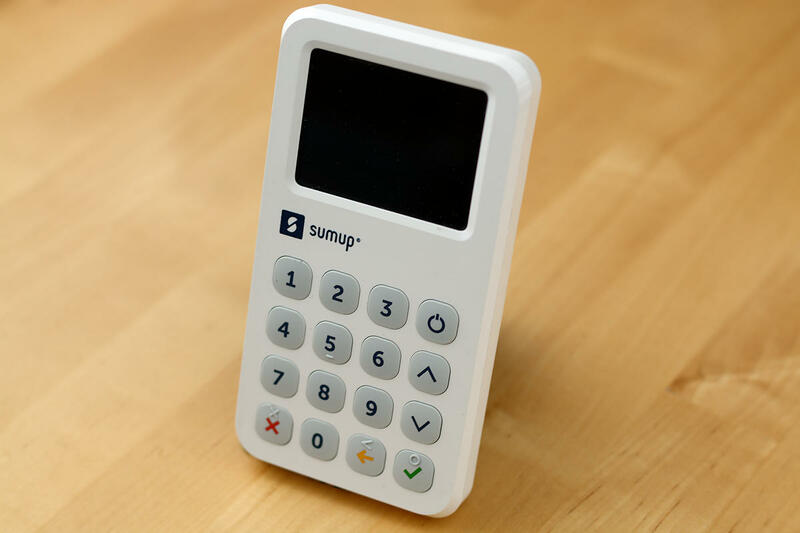 SumUp 3G is a lightweight, independently-functioning card machine accepting the most popular credit and debit cards. It’s ideal for small businesses who just want to get started accepting cards anywhere, without complex point-of-sale needs. Highs: Simple fees. No contract. Works independently anywhere with connectivity. Lows: Cannot print receipts. No out-of-the-box integration with POS systems. Buy if: You want a friction free mobile device for taking cards, without monthly fees or lock-in. 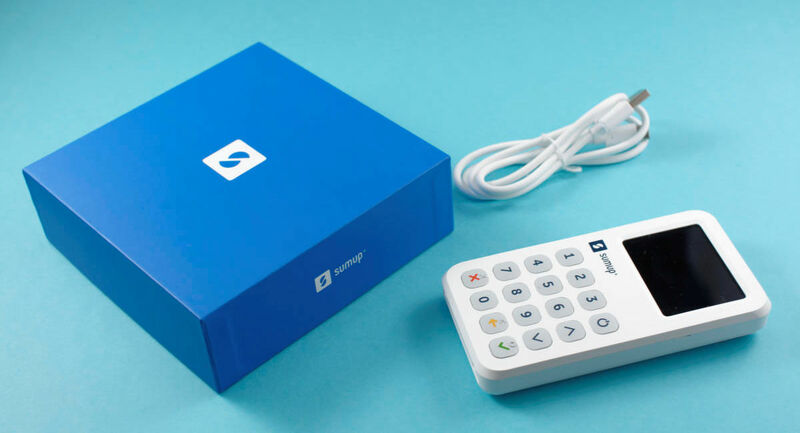 SumUp’s newest offering, the 3G card machine, is for those who want a simple way to get started accepting cards without any extra features or equipment. 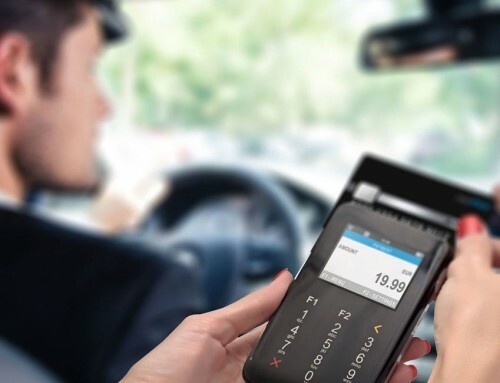 With this device, you enter the transaction value directly on the terminal, put in the chip card or tap the contactless card, and it will process the payment over the mobile network. SumUp 3G accepts Visa, V Pay, Mastercard, Maestro and American Express as well as Apple Pay and Google Pay. It’s a pay-as-you-go system, so you purchase the card reader, then pay only one fixed transaction fee for all transactions through the machine. There’s no contract or other fees to commit to, making this an economical solution for price-sensitive businesses, sporadic sales or startups that can’t predict where they’ll be beyond the next few months, or just those who need a mobile device to take cards where the customer is. 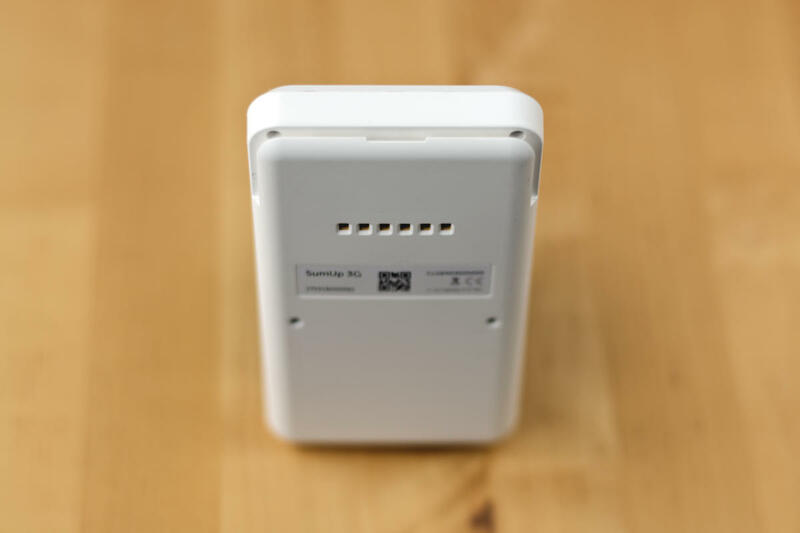 We have tested SumUp 3G, which is as small as you get a terminal with built-in SIM card. The two things you pay for are: the £99 + VAT one-off cost of the card reader and 1.69% transaction fee for all the payments processed through it. There’s no extra fees for foreign cards. Delivery of the card reader is free, and there’s no monthly fees or minimum sales volume required, so this is a pay-as-you-go system without hidden costs. They have a 30-day money-back guarantee for the card machine in case you change your mind, and one year warranty if you decide to keep it. Payments go “directly into your bank account”, meaning they automatically reach your bank account 2-3 business days after the transaction, minus the transaction fee which SumUp keeps. There are no fixed transaction limits – instead, SumUp determines these on a case-by-case basis (e.g. suspicious-looking large transactions may be flagged). Refunds are free if done straight after the transaction took place, i.e. before settlement has completed. However, if payments have already been paid out to your bank account, SumUp keeps the transaction fee for the refund. Chargebacks incur a £10 admin fee. Those who want to accept phone payments can also ask SumUp to activate a virtual terminal, which would only be accessible in a web browser. Those payments cost 2.95% + 25p per transaction. This is not an automatic feature – SumUp will look at your sales history (so you need to accumulate card machine payments for some time) and account as a whole and only add the virtual terminal if you pass their internal checks. Of the pay-as-you-go solutions, SumUp is known for having the lowest transaction fees. Their other terminal, SumUp Air, also accepts cards at 1.69% per transaction. The most equivalent card machine, myPOS Mini, advertises a 1.75% transaction fee, but this is contingent on the card being used. The rate is indicate of Visa and Mastercard transactions, while premium cards like Amex will likely incur a higher fee. 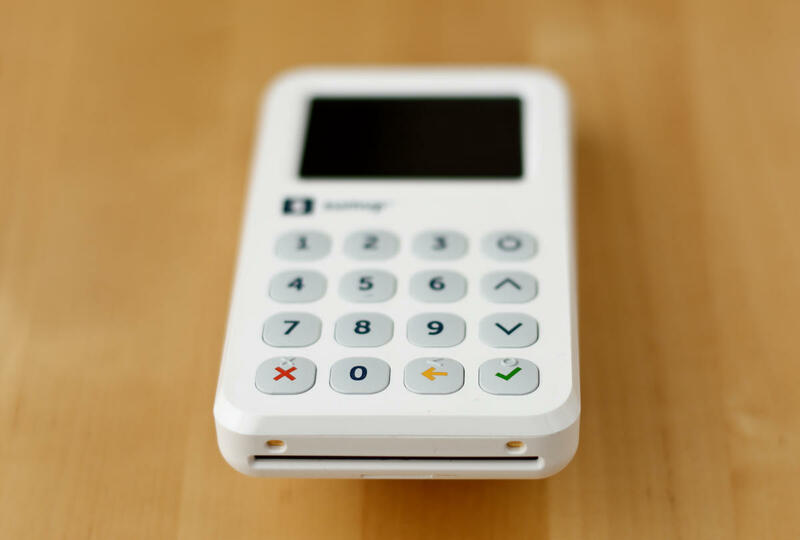 SumUp 3G is a pocket-sized card machine with an inbuilt SIM card. The terminal is very lightweight and easy to carry around compared to a traditional one, but sturdy enough to be reliable. 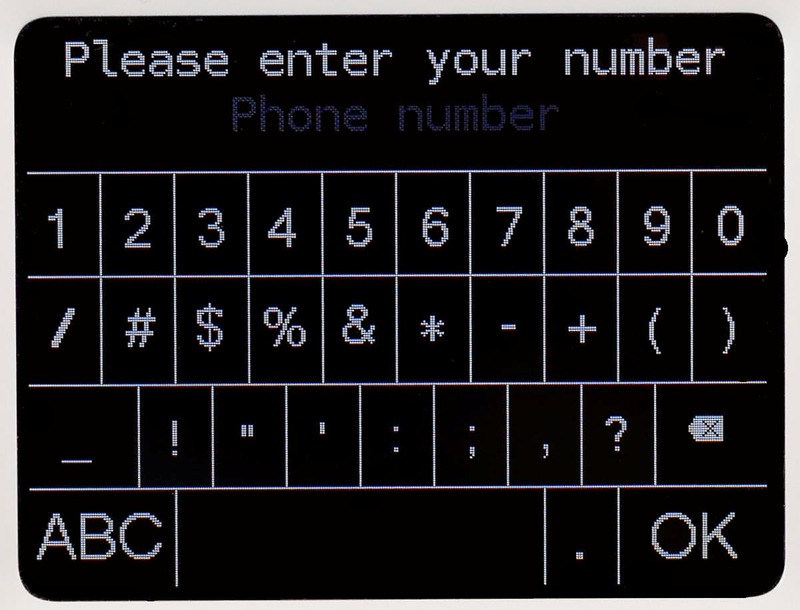 You navigate it through the keypad buttons and view the menu and information on the screen above the keypad. For some functions, you can use the display as a touchscreen. For instance, the screen gives you an option to send a text or email receipt after each transaction. 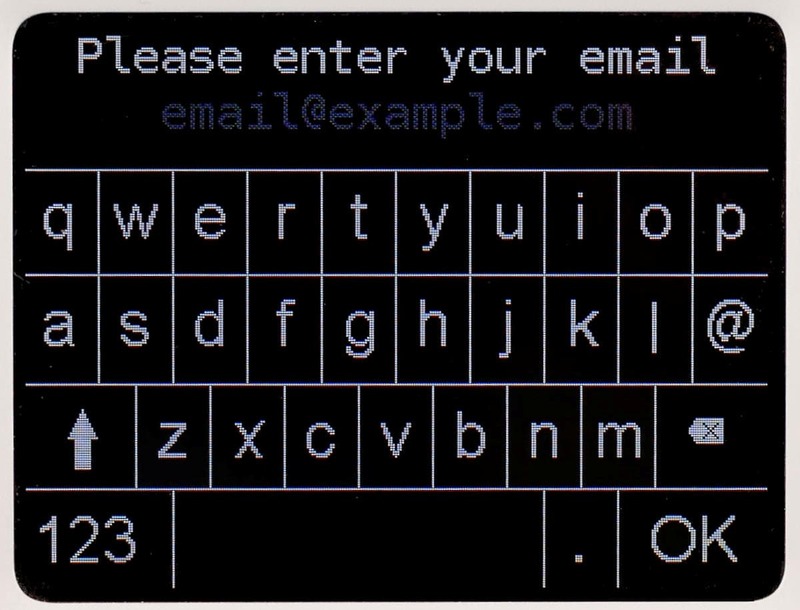 This, of course, requires you to ask the customer for a phone number or email address, or you can ask them to enter it themselves on the touchscreen in this case. It doesn’t have a receipt printer built in like conventional PDQ machines, nor can it connect to one (yet). It is limited what other more-than-basic functions are hardcoded on the device, but food businesses will like that you can add a tip on the machine before payments. 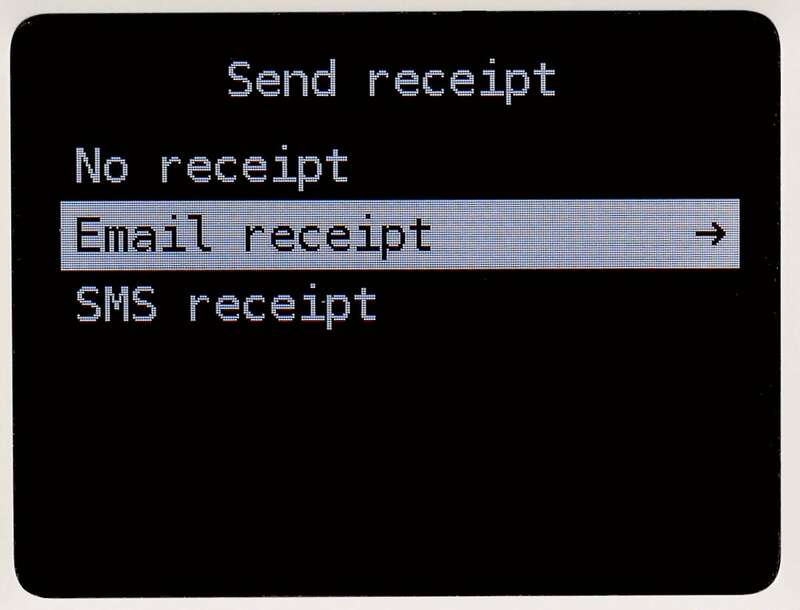 SumUp 3G displays for sending a digital receipt. The card machine makes use of the 3G network via the preinstalled SIM card in order to process card transactions. SumUp provides unlimited data on this card, so you don’t need to top it up. You just need to keep the machine charged in advance of using it and be somewhere with a stable network connection. That said, it doesn’t take much to have a stable connection, since it automatically switches between networks to get the best service. The device does not work with WiFi. Businesses with multiple staff members can use several SumUp 3G devices under the same SumUp business account. For this to work smoothly, it’s recommended you set up subuser accounts in the SumUp dashboard, so each individual can log in with their email address and password and take payments simultaneously with the other card readers. 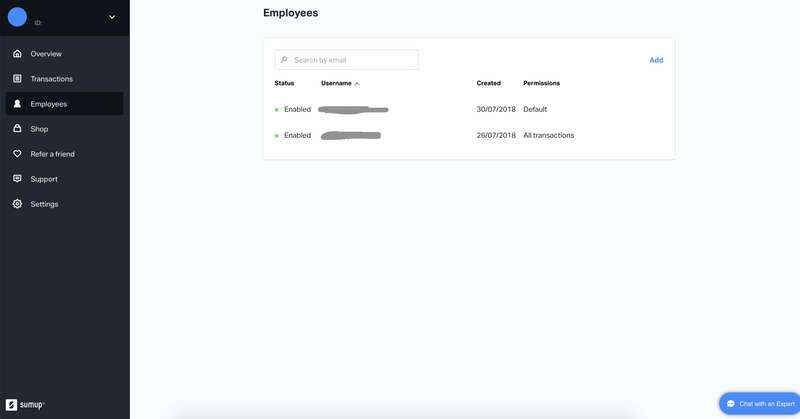 All of such subaccounts will process payments through the main SumUp account, allowing you a full, real-time overview of all your employees’ transactions in your web dashboard. So you’ve taken payments, but where do you get a record of all your transactions? As a SumUp customer, you can log in to an online dashboard accessible in any internet browser. 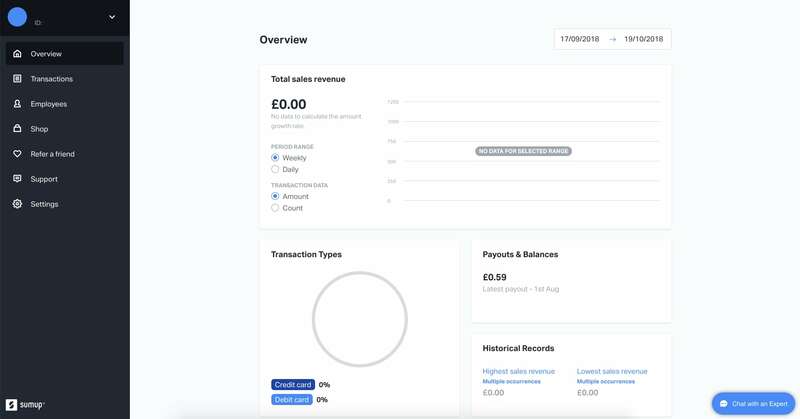 Here, you can see details such as payment history, sales categorised into card types, where the payments were made, and payout history. If you’ve created multiple user accounts, you can filter payments to focus on individual employees. SumUp emails you payout PDF reports automatically, and you can export transaction data as a CSV or XLS file from your SumUp dashboard. Furthermore, transaction history is available on the card machine display. Who is SumUp 3G suitable for? SumUp 3G is lightweight and easy to carry around, so merchants on the go can bring it to customers anywhere. That makes it perfect for use in market stalls or rural areas where connectivity is basic (it works with EDGE, GPRS and 3G). The fact that tipping is available – and it fits comfortably in your pocket – makes SumUp 3G interesting for cafés and restaurants taking orders at the table. 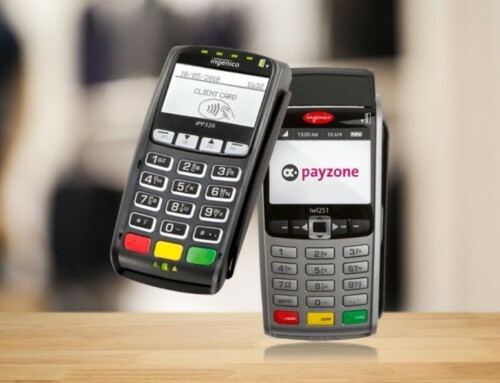 The device can be the most convenient choice for businesses that don’t need card machines to be synced automatically with a central POS system, and just want to get something at a reasonable price, low card fees and without much fuss. It cannot register individual products, but only works with payment amounts (other terminals on the market, like SumUp Air, can integrate with product libraries). Secondly, it only sends SMS and email receipts. Those two things can be deal-breakers for some businesses. If those or other POS functions are needed, you might want to consider app-based card readers. The simplified pricing structure makes it ideal for seasonal sales, since there’s no contract, monthly fees or minimal sales volume required. 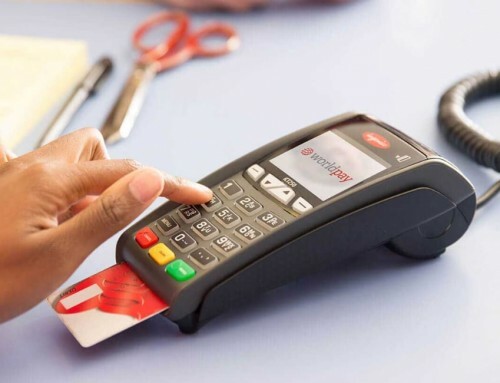 Just beware that if something happens to the card machine beyond the first year, you may have to purchase a new one, although SumUp claims they usually offer free replacements even after the 1-year warranty period has passed. However, SumUp’s machines should last a while provided you treat it well. Travelling businesses could benefit from the option to use it in countries where SumUp’s service is available (most European countries, Chile, Brazil and the US). SumUp does not accept businesses taking payments for products or services provided over a week after the transaction. Other restricted businesses include non-profit organisations, door-to-door sales, business seminars, adult entertainment, airlines, pyramid sales, and a range of other businesses, some which are dubious or high-risk in nature. SumUp’s customer support is over telephone and email, weekdays from 8am to 7pm and Saturdays from 8am to 5pm. They have a Support Centre section online too, where most user questions have been answered. We recommend checking answers there first, since SumUp can occasionally take some days to respond over email. If you need an immediate answer or prefer talking, it’s best just to call them during opening hours. 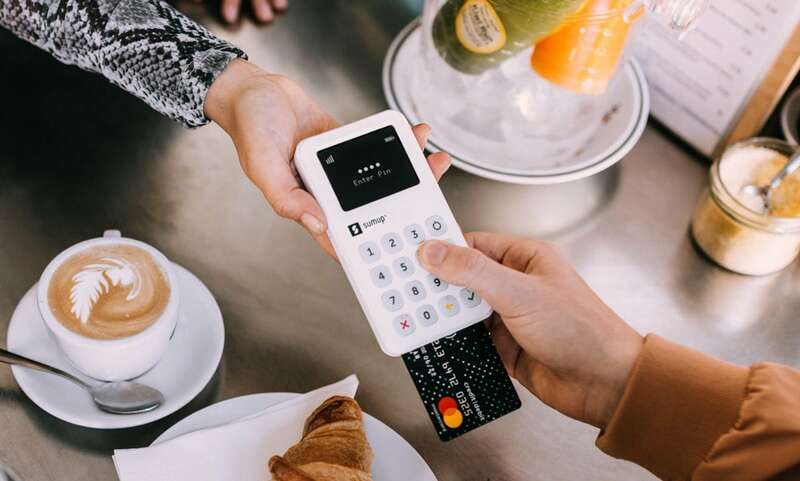 SumUp 3G is an economical solution for price-sensitive businesses, sporadic sales or startups wanting to take card payments without the hassle of complicated contracts. SumUp is a streamlined service that, because their products are so simple, usually only require minimal contact with their customer support. That said, if you’re having problems with the card machine on a Sunday or out of hours generally, you won’t get help until next working day or Saturday during their stated hours. SumUp is generally rated highly online, with many saying how valuable the service has been for them. Some users have had connectivity issues, which there could be a number of reasons for, but SumUp puts in the effort to resolve any issues flagged to them. SumUp 3G is a convenient choice for small cafés and restaurants wanting to take payments at the table. Lastly, signing up and getting an account is completely online-based. It takes maybe 5-10 minutes to fill in the sign-up pages and order the card machine. Delivery is free and takes up to a week to arrive. When you sign up, SumUp will perform some basic identity and business checks to make sure your details are legitimate and that your bank account is used by your company. 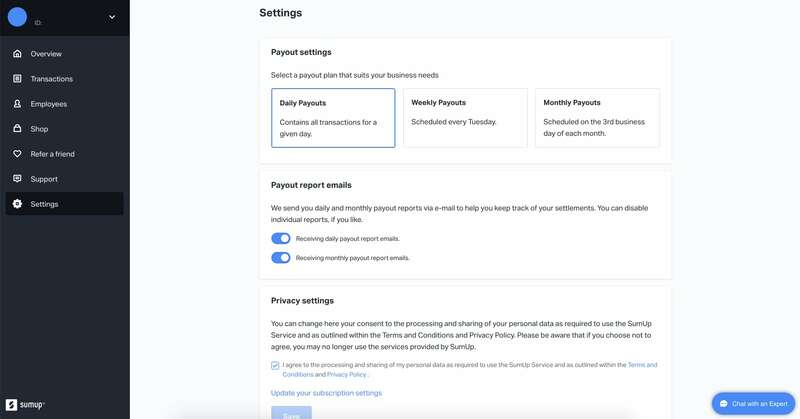 If your business is within the restricted businesses category – such as multi-level marketing or door sales – SumUp will likely reject your account. However, most merchants will have a smooth sign-up with quick acceptance of their account. There’s no simpler card reader service than SumUp in the UK, and SumUp 3G is no exception. With this, you get an affordable card machine with built-in data and software, so all you’re paying for onwards is a fixed fee for the transactions accepted, barring potential reasonable fees for chargebacks and refunds. SumUp 3G is for simple sales only, and receipts are only available digitally. Hence we don’t recommend it for expensive sales where the customer might want to retain a paper receipt for warranty or refund purposes. But if all you want is to take cards anywhere and with minimal fuss, SumUp 3G could well be your best choice.